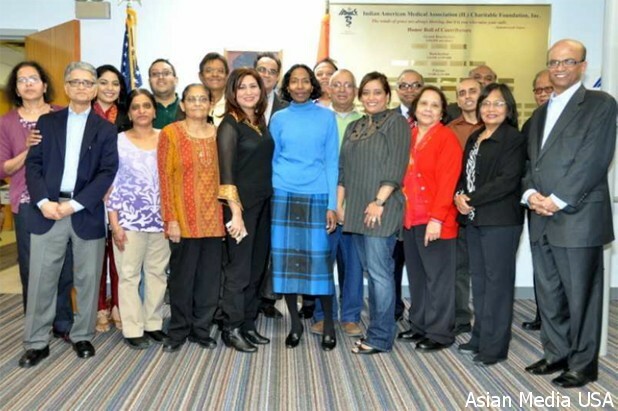 Chicago IL: Indian American Medical Association Charitable Foundation Clinic welcomed dignitaries to their open house on Saturday, 18th of February at 2645 W Peterson Ave Chicago Il 60659 from 11:30 am to 1p.m. This afternoon was clearly a celebration of the two important Chicago philanthropist of Asian Indian origin. Mr Mafat Bhai Patel of Patel Brothers and Mr. Narenbhai Patel of Medstar labs. The first plaque was dedicated in honor of Chanchalben Mafatbhai Patel who exemplified her vision that now stands as her legacy- Patel Brothers Grocery stores. Today, her passion lives on in the heart of the hundreds of medical and non medical professionals who contribute to the IAMACF clinic. Their expertise helps patients in a priceless manner for short term, long term and crisis medical conditions. The second plaque was dedicated in honor of Medstar labs that has graciously sustained a full functioning lab at the clinic. The board and all its volunteers appreciate their support. Many family members of IAMACF Board members Mafatbhai,& Narenbhai were present. In addition IAMACF Board members, Kishore Chugh, Beena Patel, Kris Zala, Drs- Jitender Dassani, Rajesh Sharma, Rambha Radha Krishnan, Sudah Velamati, Sanjay Amin, Brij Malani and Usha Nimmangada, IAMA was represented by long term supporters, Bapu Arekupudi, Alka Kale and current president and IAMACF board member Aruna Vade. Vijay Khiani, chair of NVLS and coordinator Danielle and Ms. Harisha Koneru Trustee of the IAMACF Foundation were also present. Jim Alexander from Ortho Sprague Foundation stated that the clinic is just what people need and it is one of the best community supported clinics that he knows of. He was struck by the passionate and caring spirit of the physicians, staff and volunteers. Joseph Washington. Assistant Commissioner of the City of Chicago Department of Public health said that the atmosphere was cheery, compassionate and caring and he was so glad to be amidst all the health providers. Pam Cains, President of Illinois Association of Free and Charitable Clinics states that IAMACF clinic is one of the most effective and most productive free clinic in the State of Illinois. All visitors went with a deep sense of satisfaction and knowledge that the clinic provides more than efficient medical care. The Indian American Medical Association Charitable Foundation Clinic (IAMACF) was established as 501(c)(3) in 1994. This clinic provides medical care, lab tests, and medicines free of costs to all adults. In addition, the clinic provides chronic disease management, follow up of referrals, intervention, prevention, training and wellness to all men and women who are unable to pay for their health care services. All services are culturally and linguistically appropriate. It is a unique clinic open on Saturdays, Sundays and Wednesday evenings. Very few healthcare facilities are available on weekends and evenings.. IAMACF program energizes and allows patients to understand their own health care in a comfortable and inviting atmosphere. Expert physicians donate clinic hours that are professional, individualized and informative. Comprehensive healthcare is provided to all patients irrespective of their economic status. Almost 3,000 patients were served in 2011. Suresh Bodiwala, chairman of Asian Media USA had an opportunity to interview President and CEO of Medstar Laboratory, Inc, Mr. Naren Patel who stated his reason for donating an examination room at this “Free Clinic.” Mr. Patel said, “I like to support organizations that provide selfless services to the underserved individuals in our community because they are doing valuable work.” He praised all the volunteer doctors that are providing free services to patients at this clinic is very commendable. “In these tough economic times, the under-privileged families struggle to keep a roof over their head. They are seldom able to monitor their health and their children’s health due to lack of resources, health insurance and insufficient income. These are very critical issues in our society, he said. Mr. Patel also stated, “If we can make a slight difference in someone’s life, through Medstar Laboratory’s support to the IAMACF, then I am fulfilled.” Mr. Patel is also a Board Member of the Indian American Medical Association Charitable Foundation and has been supporting this organization for over six years. Mr. Patel is also a strong advocate of providing quality education to children around the world. For the last few years, Medstar Laboratory has supported Akshayapatra International Organization which serves warm meals to students from low-income families in schools across India. They also have supported Ekal Vidyalay, Pratham and other non-profit organizations that focus on bringing education to children in impoverished communities in India. Mr. Patel’s belief is that all children should have a right to build a bright future and through his participation in these organizations, he is helping to make that happen. Mr. Patel’s two sons, Neal and Raj Patel, also believe in the same ideology and follow in their father’s footsteps in regards to giving back to the community. Each year during the Christmas season, the Medstar family engages in the spirit of giving by providing gifts to children from low income families. Medstar Laboratory provides ongoing financial and health-care support to various community based organizations including: BAPS International Non-Profit Organization, Erie House Family Health Center, Rainbow PUSH Coalition, Swaminarayan Temple of Itasca, Midwest Asian Community Center, Indian American Medical Association Charitable Foundation Free Clinic, and various other religious institutions. Medstar Laboratory, Inc. is a state-of-the-art laboratory located in Hillside, Illinois, just off of the I-290 Expressway. Over the years, Medstar has become technologically advanced in all aspects of laboratory testing, as demonstrated by the quality of reporting of laboratory results. Under the thriving young entrepreneurial leadership of Neal and Raj Patel, Medstar Laboratory has expanded its operations to serve the clients across the Midwest in Illinois, Indiana, Michigan and Wisconsin.